Radio Galaxy Pictor A. 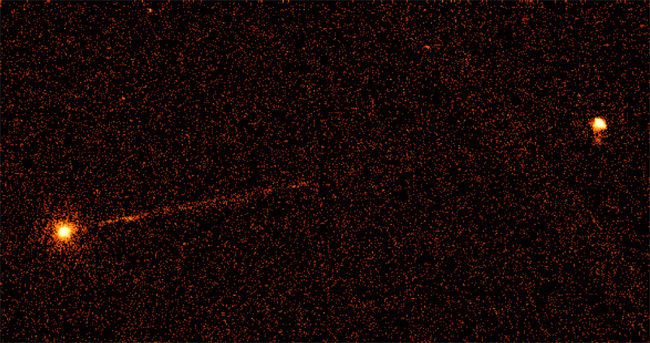 The Chandra X-ray image of Pictor A shows a spectacular jet that emanates from the center of the galaxy (left) and extends across 360 thousand light years toward a brilliant hot spot. The hot spot is at least 800 thousand light years (8 times the diameter of our Milky Way galaxy) away from where the jet originates. 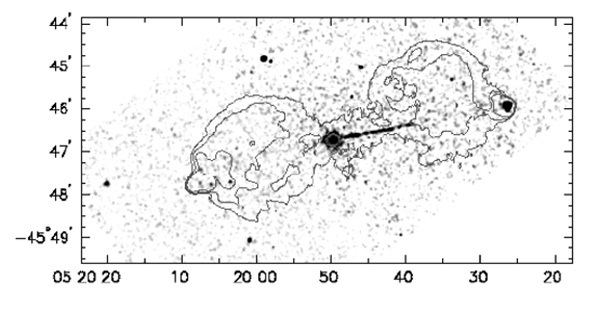 The hot spot is thought to represent the advancing head of the jet, which brightens conspicuously where it plows into the tenuous gas of intergalactic space. One possible explanation for the X rays is that shock waves along the side and head of the X-ray jet are boosting electrons and possibly protons to speeds close to that of light. Jets are thought to be produced by the powerful electromagnetic forces created by magnetized gas swirling toward a black hole. Although most of the material falls into the black hole, some can be ejected at extremely high speeds. Magnetic fields spun out by these forces can extend over vast distances and may help explain the narrowness of the jet. Scale Image is 4.2 arcmin across. Coordinates (J2000) RA 05h 19m 49.70s | Dec -45° 46' 45"